I've been up to my eyeballs with work, so I haven't had time to try any new cookbooks, but I did remember to take photos of this stuffed bread I made a couple of weeks ago. 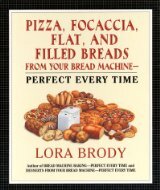 So today's post is a recipe from Lora Brody's Pizza, Focaccia, Flat, and Filled Breads from Your Bread Machine, which I've written about before. This is a great way to eat your greens and tastes pretty good the next day too. 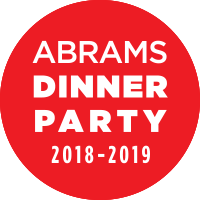 The dough is for the bread machine, but if you're used to making bread by hand, you can just use any semolina flour dough. Place the ingredients in your machine according to manufacturer's instruction and use the dough cycle. While dough cycle is running, saute garlic in oil in a large frying pan until it just begins to color. Add remaining ingredients, stirring 2 to 3 minutes until well blended. Remove pan from the heat and set aside. When the dough is ready, remove it from the machine and divide in half. Use olive oil to lightly oil a 12-inch flat pizza pan. Roll one piece of dough out to a 13-inch circle and place in the pan. Spread the filling over the dough, leaving a 1/2 inch border. Roll out the other dough to a 12-inch circle and place on top. 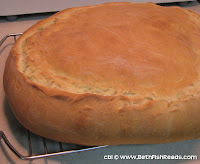 Fold the edges of the bottom dough over the top and pinch to seal. Cover with oiled plastic wrap or a towel and let rise for 1/2 hour while you heat the oven to 400F. Bake the focaccia for 25 minutes or until it is a deep golden brown. 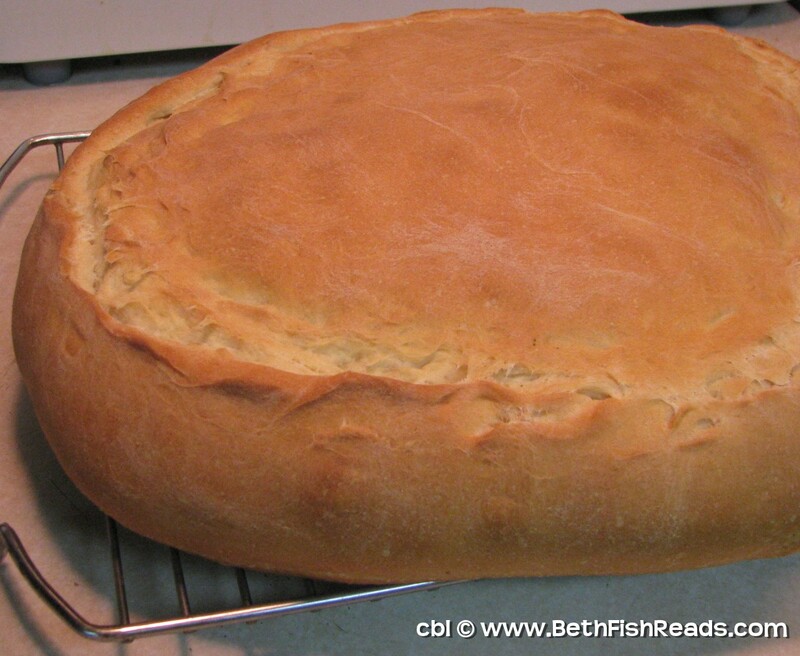 Remove the bread from the pan and let cool on a rack for 10 to 15 minutes. Cut and serve. Beth Fish's notes: I generally leave out the anchovies because we find them too salty with the olives and capers. This looks delicious. I am going to have to do something about getting my oven fixed soon I think. A post that was two weeks in the making from me! Oh yum! 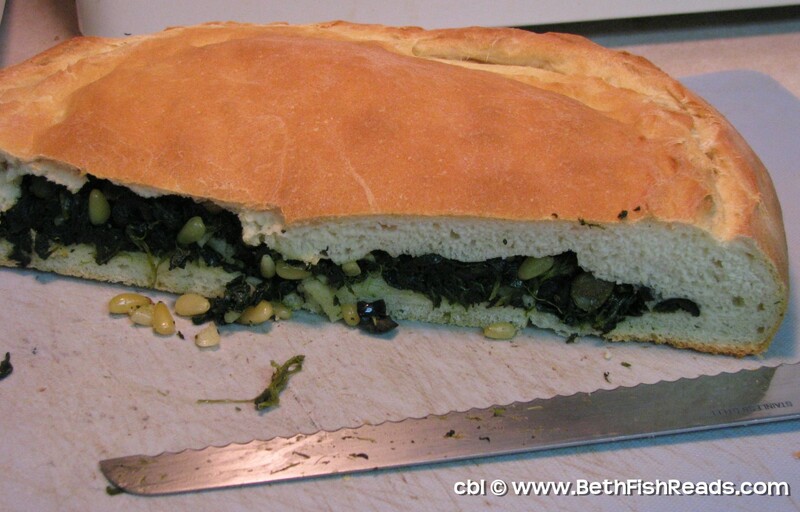 I love focaccia and I love greens, so this has win! written all over it! oh, I think a wee bit of cheese would be lovely in there too...I love garlic and greens..
That is just beautiful!! I'm sure it tastes as delicious as it looks. That sounds and looks heavenly to me! If I tried to create it, it would never come out that good. This could be the recipe that gets me to try making focaccia! I'd leave out the anchovies, too. I love the sound of this one - I've never made anything similar. I'm going to have to give it a try and will let you know how I get on. I love stuffed bread! I make one called stromboli and it is definitely my favourite. I would love to try this one. Wow, I haven't made foccacia in ages, and it would be fun to try it in our relatively new bread machine. I think I made mine with just garlic put through a press, and rosemary. Yum - I can almost taste it. Thank you for the reminder!! I posted a cranberry cake recipe which is out of this world delish! This looks great, though I have always been a little shy about making Focaccia. But maybe I will give it a try this week. You are seriously a culinary goddess! This looks amazing and I'm not a fan of greens at all. This really looks delicious. I might give it a try. Hmm. This is giving me ideas. I wonder if you can stiff cornbread. This looks absolutely fantastic! 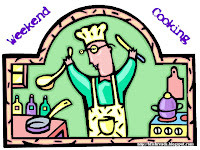 You always have the best weekend cooking blogs. I love love love them! This looks really good! A friend gave us a bread machine a while back, but we haven't used it yet. Looks like a great recipe to try with it. That looks amazing yet the instructions are so reasonable. I don't think I have ever had anything even remotely like this, and I am intrigued with it. I also think that the recipe seems easy to follow, so I may have to give it a try! 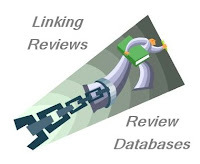 Thanks so much fir sharing this! I love bread and focaccia's one of the types I enjoy.